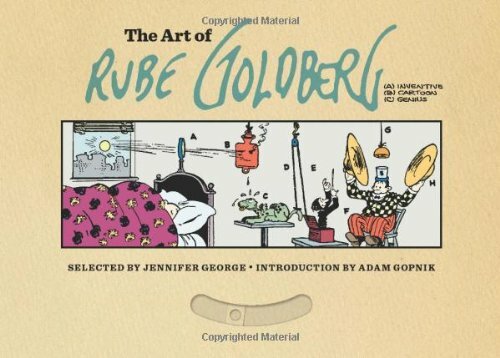 This large landscape book is an affectionate and wonderful celebration of Goldburg's art with several dozen examples of his cartoon inventions but there was much more to him than that. As well being a cartoonist he produced comedy shorts, wrote newspaper columns, did some screen writing for Twentieth Century Fox, starred in his own TV show, drew editorial cartoons and when he retired in 1964 took up sculpture. The first comic strip, in 1908, was called 'They all look good when they're far away', the crazy invention cartoons started in 1912 and by 1915 his work appeared in newspapers all over America. During the Forties he did more political editorial cartoons and I thought his style was rather similar to the Washington Post's Herblock especially in the use of a textured tone to show depth. He's quoted on page 169 saying "Political cartoons were easier for me than the inventions because they were almost pure idea, and the draftsmanship relatively simple". Goldberg's delightful invention cartoons frequently had an inspired extra panel, bottom right, sometimes called Foolish Questions where he allowed his offbeat sense of humour to flow. For example on the invention drawing for May 14, 1929 is Foolish Question, number 47,389,100 showing a couple in bed with the word 'meow' in the window frame, she says "Is that a cat? "- he says "No, it's a mule giving an imitation of a mocking bird". Foolish Questions was, in fact, his first real cartoon hit when it started as a single panel in 1908, five hundred were created between 1908 and 1910 and book reprints soon followed. Rube Goldberg was famous enough to have his name used as an adjective in Merriam-Webster's dictionary and exactly the same thing happened to Heath Robinson (1872-1944) a British artist who also drew comic inventions though his work was featured in magazines rather than newspapers. The Shorter Oxford Dictionary carries his name under H. Both names are used when referring to a complex devise that solves a simple task. The book is a treat to look through, the 194 pages probably contain a few hundred graphic items, obviously most are cartoon art but also historical photos and bits of historical ephemera and near the back ads that Goldberg either did the art for or appeared in as celebrity endorsements, book jackets he designed, photos of his sculpture, family Christmas cards and more. All of this is beautifully served up with handsome layouts and typography. A nice touch, I thought, was printing the older cartoons in sepia , sometimes on light sepia pages (all the sepia is four colour created). Seven writers contribute all you really need to know about Rube, his granddaughter writes a sweet essay about him and I liked Peter Maresca's piece placing Goldberg in the context of American newspaper comics. With the wonderful art, essays and nor forgetting the fun hands-on front cover (your finger controls a tab that moves nine items at once) there will not be a better (looking) book about America's favourite cartoonist. A complete bit of artwork. There are plenty of crazy Rube invention panels throughout the book. Ads that used Goldberg inventions. A spread from the back pages with, on the right, a Goldberg timeline. Right: an editorial cartoon that won a Pulitzer Prize in 1948...very much like the style of Herblock from the Washington Post.